This idea has been in my thought for a longtime. I am a member of a small group in Japan called “000 Global Vision” which is driven by my friend who is an alternative educator. Our main purpose is living to be aware of connecting with all lives which create this universe. It’s a kind of mindfulness living. He has been organizing “Rainbow Camps” all over the world offering an opportunity for children to make their own decisions what to do during the camp instead of let them choose from choices that adults prepare in advance. In the camp children learn how to compromise with others, gain self esteem and confidence and learn skills to make decisions in a group. It’s based on the trust on all human beings even they are young for their ability to own their learning. He also had been making a big sand whale at beach in HI blessing all lives on the earth. Anyway, I wanted to make something combine “rainbow” and a ‘whale’. Rainbow to me is a celebration for all races and believes, hopes and faith in something we don’t see. 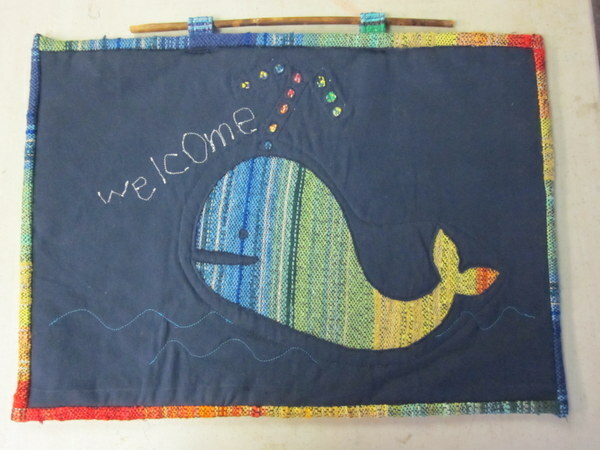 I am planning to make a series of the “rainbow whales’ this spring. This one is at my door. This is just adorable and I love the sentiment behind it. Please have a workshop in doing this reverse applique. Have a wonderful day. I love the smiling rainbow whale! You’ve done a formidable task and our whole group can be thankful to you.